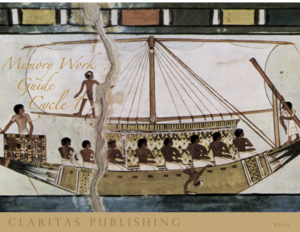 The Cycle 1 Memory Work includes 28 weeks of grammar pegs in the following subjects: History, Math, Science, Latin, English Grammar, Scripture, Geography, Hymn, Timeline. This will take your family from Creation through the Fall of Rome. Are the videos able to be viewed any day, anytime, or anywhere? Are they able to be viewed via mobile device? The videos can be viewed any day, anytime and anywhere! You can see them on mobile devices. Of course, in the event of an “act of God”, or wifi or power outage where you cannot access the internet, you may not be able to access the site. Also, there were two days last school year where I had to upgrade the website, but to the best of my knowledge there have not been any other problems with families having difficulty accessing the videos. I am very eager to help any customer who is experiencing technical difficulty, and we have always been able to solve the problem. what does it mean that “Cycles 1 & 3 are the same and Cycles 2 & 4 are the same”? Are the content of the materials the same? Or other aspects of the materials the same? Math and English are the same memory work and same songs for Cycles 1 & 3, and Cycles 2 & 4. This style of learning is all about repetition. The math and english memory work will prove very valuable in the later years of learning. Please don’t hesitate to ask any other questions! Can we pick a start date and end date? Do we have access to all 28 weeks every month? Thank you for contacting me. When you sign up on the Cross Seven website, you have a monthly payment plan of $3.97, set up through PayPal. You have access to all the memory for that Cycle for as long as you desire. Some folks subscribe, and after they have completed one cycle, they send me an email to switch to another Cycle. Your access is continuous until you decide to cancel. Are the songs used in your videos of memory work the same as on the CDs available from Claritas publishing? How long are the videos? Is it one per week? Thank you for your question about the Claritas Publishing memory work. There are nine subjects each week and if you watch the full week of memory work it can last between 6 – 8 minutes per week. There is new information each week.